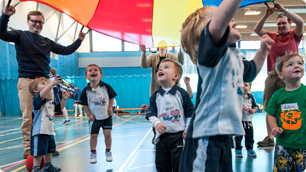 Rugbytots' toddlers classes are for parents as well! Our toddler classes require full parent participation. 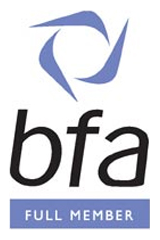 This offers a fantastic opportunity for you and your child to spend quality time together. 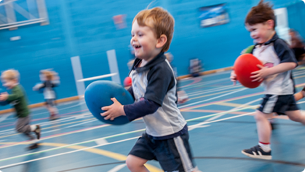 Rugbytots' toddler classes provide a fun environment for your child to learn new skills, meet new friends and have an exciting introduction to rugby. The classes take place weekly and last 30 minutes. 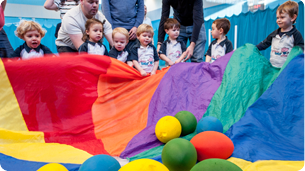 They are colourful, lively and a great experience for both children and parents! Activities to exercise your toddler’s body – and their mind! Our pre-school activities incorporate fast-paced fun with learning. The activities for toddlers teach your child about shapes, colours, numbers and counting. 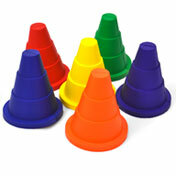 And as well as enjoying team games, you child will be encouraged to work independently. We introduce rugby-specific skills nice and gently. All the equipment used in our toddler classes has been specifically designed and selected for 2 to 3½-year-olds. 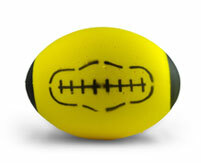 For example, we use sponge foam balls so that your child can catch, pass and kick their goals with confidence.